Like the Starship Enterprise of Muni, the 14L-Mission Limited flies down Mission Street, leaving its partner in crime, the “regular” 14-Mission, in the dust. Within minutes of stepping on the 14L at 24th Street, we had already hit the southern gateway of the Mission, which in Muni land is the Mission and 30th Street stop. Years of riding Muni had taught me to expect anything but lightning fast transportation. Arriving suddenly at 30th Street, I jolted out of my seat, hopped off the bus, and sprinted across the street to catch the rapidly approaching northbound 14L. It was 7:10 a.m. and the 14L was packed. Bodies of all sizes poured off as I waited — seemingly for minutes — to board. Later, bus driver Roger Marenco confirmed what my experience had made fairly clear — there are in fact no maximum capacity limits on Muni. Elbowing my way onto the bus, I quickly clutched the nearest available pole before the jolt of the gas pedal propelled me forward into the masses. My five-hour adventure on Bus 14, and its expedited variations, had begun. Music blasted from someone’s smartphone. First it was Snoop Lion who entertained us all. Later Whitney Houston reminded the entire bus that she will always love us. Indiscernible rap later emanated from a teenage girl’s phone as she shouted over it to tell a teenage boy sitting one seat away about her class schedule. Oldies and Latino radio soon followed. Over the five hours, every single music-blasting phone on the 14L and 14 had one thing in common: they were all blaring music unplugged from headphones. It seems that the 90’s boombox-on-shoulder has found its replacement. As the 14L headed northbound, its vibrant life dissipated. With at least twice as many people pouring off as coming on, the crowd quickly thinned once we hit 24th Street. Swaddled in her fluffy white scarf, a woman slept soundly the entire way until the electronic monotone voice of the 14L called her stop: Main and Market. Two stops away from the end of the line, she awoke to an alternate universe. Now there were just three of us on the bus: me, the bus driver and one other passenger. 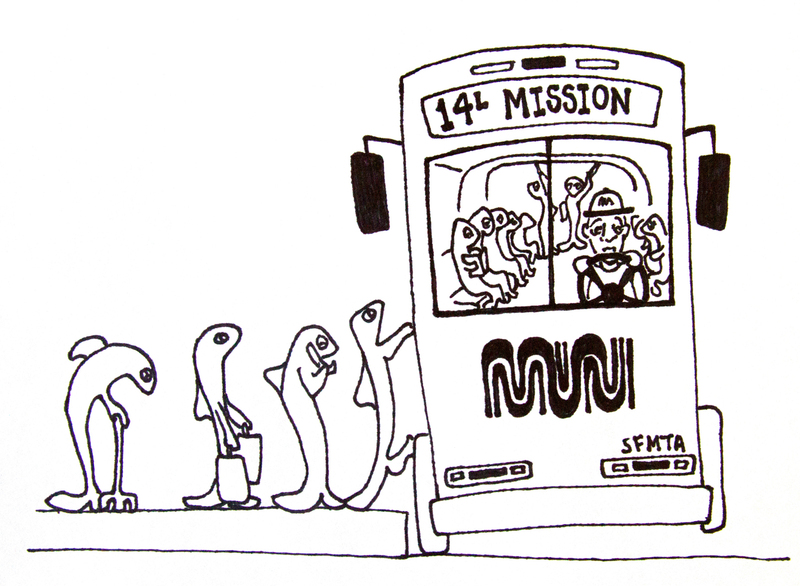 Once we hit Mission and Main, the 14L’s turning point, the last rider other than myself got off. The bus sat idle for minutes and so did I, patiently waiting for the southbound journey to begin. That’s when I met Roger Marenco, 31, the 14L driver. Born in El Salvador and moving to the Mission at the age of 8, Marenco became a Muni driver five months ago after finishing a B.A. in environmental justice and sustainability at San Francisco State University. Passionate about starting his own organic farm in Nicaragua, Marenco is driving the 14L while he saves up to buy some land. On our southbound journey, people slowly began to populate the bus, but the activity and musical acts paled in comparison to the fervor of the northbound journey. As we passed the 16th Street BART station, people swarmed a cop car and watched intensely as the cops loaded a fiery man into the back of the car. It was 8:10 a.m.
Two stops later a grey-haired middle-aged hippie played his guitar and sang to an invisible audience at the Mission Street and 18th Street bus stop. Yep, we were back in the heart of the Mission. By 30th Street the bus was still a ghost town compared to an hour earlier. Marenco said that the rush to the Mission begins at the Daly City BART and grows in intensity at each northbound stop from 6 a.m. to 9 a.m. This rush reverses from 3 p.m. to 7 p.m. I decided I needed to go beyond the Mission’s borders to see where the Mission’s workforce was coming from. Heading farther away from the city, every 14L northbound stop was packed. Southbound stops were nearly empty. Once reaching the Daly City BART stop, the bus picked up a few people and headed north again. By the second stop every seat in the once-vacant 14L was filled. As more people piled on at the third stop, Marenco turned to me. “This is why we have delays,” he said as he pointed to the line of people waiting to stick their crumpled dollar bills in the thin slot of the fare booth. At the fourth stop, a school group of little children got on the bus, wiggling their way deeper into the congested aisles as their teacher directed them where to go. “Where are you going?” Marenco asked the school teacher. “Steuart,” she replied as she disappeared into the mob. It was going to be a long ride.